Industry's only Cast Iron Electrodeposition Coated direct replacement exhaust products. This product is not only coated on the outside surface but on all inner surfaces including the water jacket. 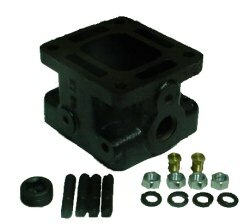 Fits Mercruiser GM small block V8 and GM big block V8 engines. Fits both sides of engine. Replaces Mercruiser #’s 93320A5 and Osco #3320. Includes mounting fasteners and gaskets. This is a complete set of 2 pieces.